Having decided on or even implemented a course of action to bolster the performance of your Mini’s engine, maximising it’s potential should encompass a good look at the gearbox. It rarely does, as most folk take one look at those seemingly formidable teeth and decide it's not for them and stay well clear. The fire of this fear is fanned by those crafty specialists who know the ins and outs of the Mini ‘box, to a point where paying somebody to sort the job is a far better prospect than doing it yourself. The cost of which influences the decision. However, I’m here to tell you that the most difficult part of dealing with a gearbox is having the tools to do it. Apart from a reasonable selection found in an average tool kit, the only other essential tools are a 1-1/2” AF socket (or spanner if you really must, as used to do your ball joints), a 1-1/8” socket (as used on drum braked Mini hub nuts) and a decent knuckle bar. These are needed for the pinion nut and first motion shaft nut respectively. Sockets are needed really as it's impossible to torque nuts up with a spanner! Torque wrench needed should be capable 0f dealing with 150lb ft. Stripping a ‘box takes less than three-quarters of an hour, re-building a careful hour once familiar and all parts are cleaned. Seriously. I’m not going to go into how to strip and re-build the gearbox here, as this is dealt with fairly well in workshop manuals (Haynes is best here as Rover manual assumes prior gearbox knowledge).What I want to do is arm you with a little knowledge of just what the gearbox is all about, how it works, and eventually what the differences in types are. The fear instilled by almost anything you can name comes mostly from one source - the unknown. The start of which is a fundamental grasp on whatever the subject might be. In this case the grass roots is actually what the gearbox does, or more to the point HOW it does it. It's really far more simple than the first impression given when gazing into the gearbox for the first time. Think back to those halcyon days of school, in particular the physics classes. Elementary physics taught us about the laws of leverage, you know - long levers make it far easier to move heavy objects than short ones, pivotal points, and so on (usually backed up by studies of how the Egyptians built pyramids, erected monoliths, how Stone Henge was built, etc.). Well, the gearbox in your redoubtable Mini is no more than a collection of different length levers to move the weight of it about at varying speeds. The clever bit was getting these levers into such a small, compact space. So the designers rolled the levers up to form a circle - thus forming a continuous lever. Neat, eh? See following diagrams for pictorial representation. We’ve now changed our levers into gears, and will refer to them as such from now on. 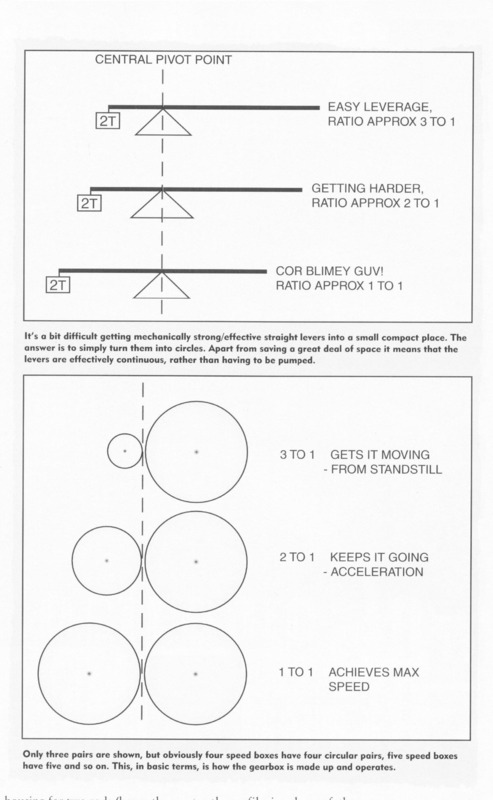 Having sorted that, all that was needed was to come up with a bunch of gear ratios to get the car from a standstill, develop momentum (acceleration) and finalise a suitable end point (top speed) - achieved by considering the engines available performance. Good thing about engines is their relative flexibility - i.e. torque/horsepower/rpm range. And that's it, nothing fancy or desperately brilliant. Now the light has been switched on up there in those little grey cells on to the basics, lets move swiftly along to the chain of events from engine to wheel. It briefly goes like this - the crankshaft provides drive through the ‘drop gears’ (primary gear, idler gear, and input gear) into the gearbox. 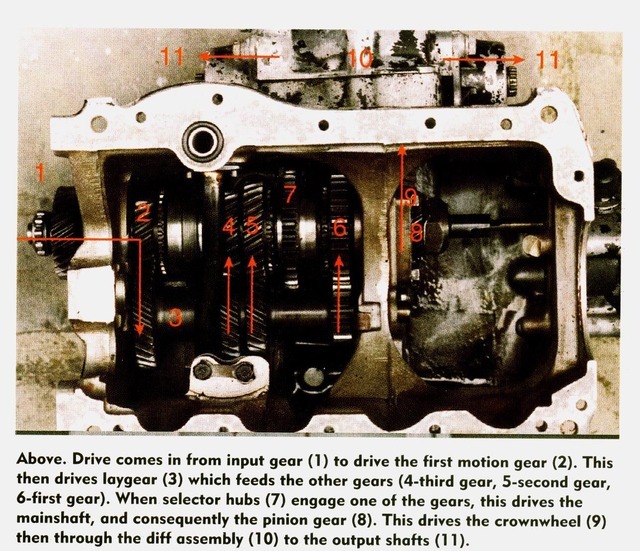 The drive into the first motion gear (some call this fourth gear) transfers to the big one-piece gear (laygear), then back into the individual gears on the mainshaft. A ‘break’ between the first motion gear and mainshaft, and bearings under the gears allows them to rotate freely until they’re selected by one of the two selector (syncro) hubs positioned between these gears - 'selected' by the action of the syncro hub sliding sideways to lock into the relevant gear. These hubs permanently drive the mainshaft by being engaged on a coarse spline and in turn are driven by the selected gear by the small teeth on the gear (dog teeth). Drive is then transferred from the mainshaft via the small pinion gear on its end - also permanently driven by the mainshaft on a coarse spline. The pinion drives the big gear (crown wheel) attached to the differential (diff) assembly, to the drive shafts, and finally to the wheels. The pinion and crown wheel gears are commonly referred to as the final drive gears - as that’s what they are! The diff assembly houses the output shafts and two small pinion wheels. These allow for mediation when one wheel is turning faster than the other - such as going round a tight corner, the inside wheel traveling less distance than the outer. If there were no mediation the car would be horrendously difficult to steer round such corners, wanting to drive straight ahead. This mediation in the gearbox is described as allowing a 'differential of wheel speeds', hence the name 'diff' (short for differential0. Long winded in words, so take a look at the pictures for easy reference. Next step is how the drive goes from the input shaft and laygear into those free-wheeling gears into the mainshaft to actually drive the car along. Instigated, as I am sure you all know, by depressing the clutch pedal, and shoving the gear lever at the required gear. This can sometimes be accompanied by a slight graunching noise - diagnosed generally as worn ‘balk rings’. 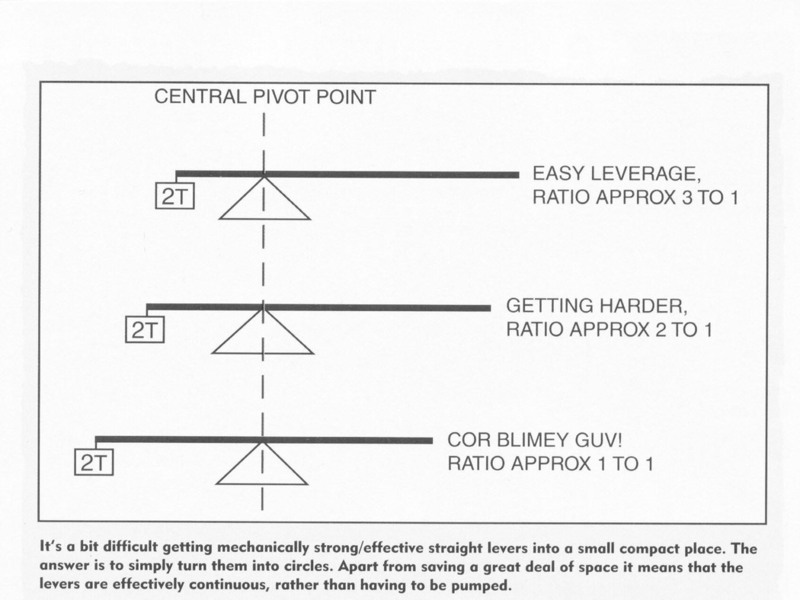 A component often discussed, but about which little is understood. As it’s a common problem with Mini gearboxes, this is our next area of investigation as it’s associated closely in the events detailed at the beginning of this paragraph. I’m sure most of you have experienced the noises emitted by vintage cars - of particular interest to us is that graunching and grating noise accompanying attempts to get the monster in gear - whether this be at a standstill or on the move. This is the great-grandfather of that experienced in our latter-day Minis alluded to above. The reason for their musical accompaniment is the design of the gearbox. Not unrealistically termed as a 'crash 'box', as that’s exactly what’s going on inside - gears being crashed together until they engage. The cause is gears rotating at different speeds - or out of ‘sync’ - to each other and the crankshaft. The initial solution was driver experience - the better experienced being able to assess when the different components were rotating at a favourable speed relative to each other before making the change, minimising the crunching. These ‘crash’ gearboxes used a ‘non-constant mesh’ design. Basically it entails sliding the teeth of the gear pairs together, and hoping they engage at some point. Pretty hit and miss considering the numbers of teeth involved on any particular gear! 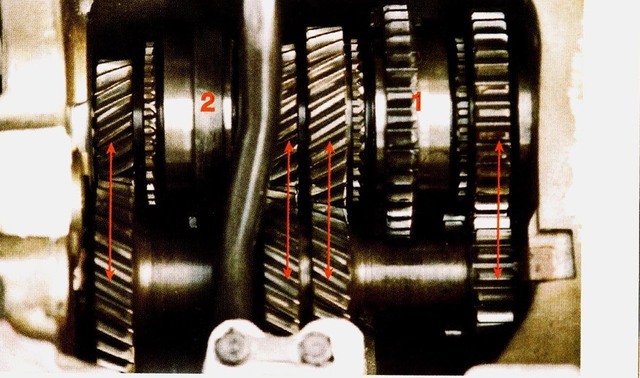 Next came ‘constant mesh’ type gears - as used in your Mini’s gearbox now - where the gear pairs were constantly engaged, selected by an independent hub sliding sideways to ‘engage’ the gears. This design allowed a closer matching of speeds of the components, vastly reducing the graunching (and consequently wear/breakage). This was further developed, as getting a bunch of teeth to match up first hit took skill and cars were becoming the norm rather than an exception. They therefore had to be a great deal more user friendly. To assist in matching the relevant speeds of all components without exacting skills from the driver, a mediator was needed - enter the balk ring. This simple device is placed between the selector hub and gear,. 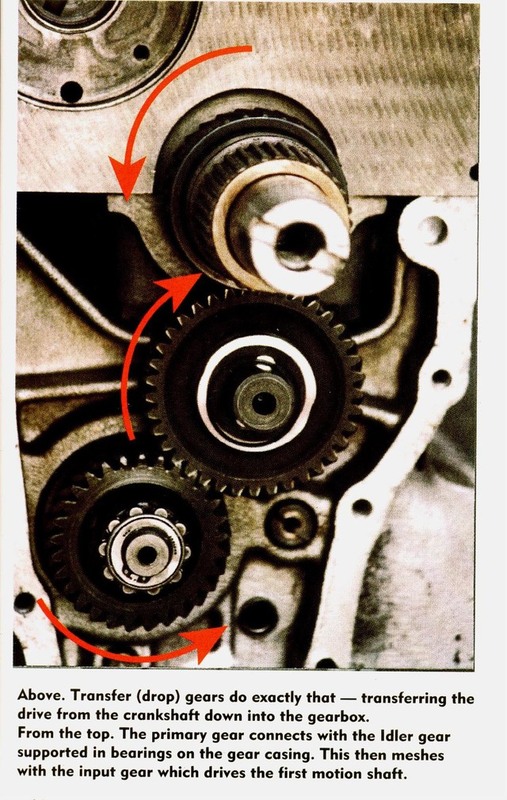 When a gear change is made, the selector hub is pushed up against the gear, the balk ring drags on a tapered surface on the gear - located by three lugs on its external circumference by the selector hub to prevent it spinning - and either speeds up or slows down the engaging gears to the speed of the mainshaft and selector hub. Hence a much smoother gear change is attained with a vast reduction in wear. The slight crunching experienced in your Mini occurs when the balk rings wear, becoming inefficient at slowing/speeding up the relevant parts. Unfortunately, the early Minis didn’t benefit from a completely syncronised box of cogs! Initially fitted with a ‘three-syncro’ gearbox, the annoying/damaging crunch remained on first gear for a surprisingly long time, first gear being cut on the outside of the first/second synchro hub outer track, doubling up as reverse gear. It still relied on getting teeth to engage easily first time, considered not to be a problem with the engine at idle speeds. How wrong they were!